What an exciting week for InsurTech! Starting Tuesday, November 27thand continuing into Wednesday, November 28th, the Hartford InsurTech Hub hosted their Selection Days. Across these two days, 22 InsurTech startups were invited to showcase their companies to mentors, partners and students. At the end of Selection Days, the goal was to select 10 companies to join Startupbootcamp’s Accelerator Program. Each day began with a round of introductions. Dawn LeBlanc, Managing Director at the Hartford InsurTech Hub, briefed attendees on the expectations for each day and the process they took to reach 22 invitees out of thousands of possibilities. Sabine Vanderlinden, CEO of Startupbootcamp, presented on topics surrounding the growing industry of InsurTech and its added value to the traditional insurance industry. 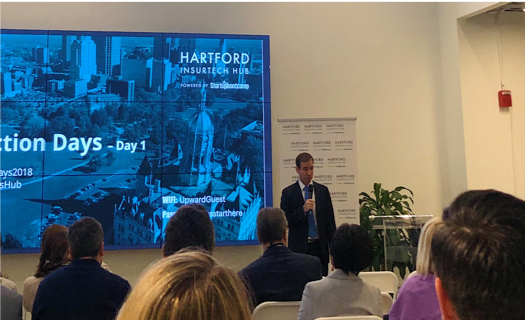 Mayor of Hartford, Luke Bronin, was also in attendance to discuss the future of InsurTech in Hartford and the impact it will continue to make on the nations insurance capital. The day continued on with pitches from the 22 startups. Each startup was challenged to pitch their business models within 60 to 90 seconds. Attendees were introduced to InsurTech startups that had a focus on just about everything including artificial intelligence, blockchain, customer experience and claims processes. Following the pitches, each startup had the opportunity to receive feedback and discuss pathways to success with partners, mentors, and investors across the insurance, finance, and technology industries. 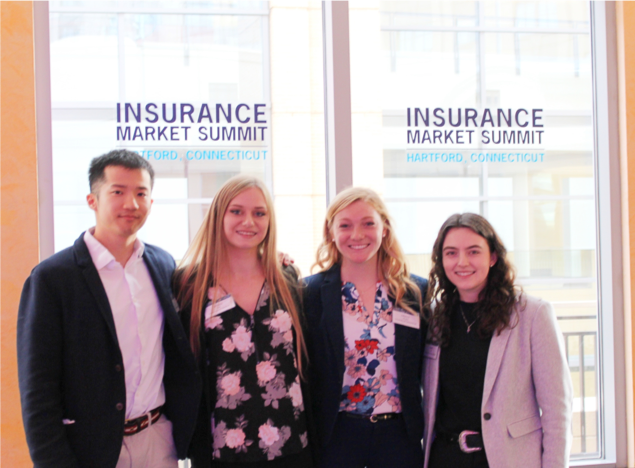 After the Selection Days came the Insurance Market Summit, held on Thursday, November 29that the Marriott Downtown Hartford. 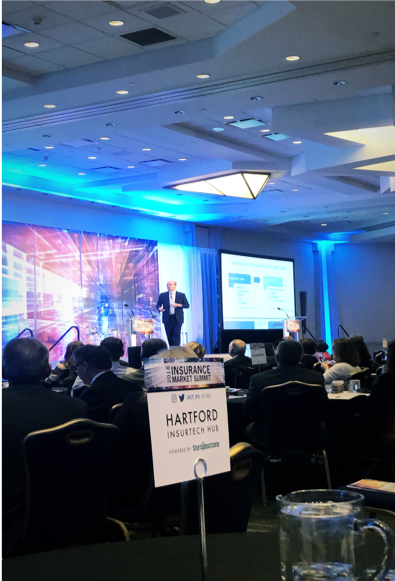 This day was filled with high energy and excitement from insurers, investors and partners from the surrounding area in Hartford, CT. Keynote speaker, Tom Wamberg, CEO of Wamberg Genomic Advisors, started the morning with a fascinating presentation on genomics and some of the innovative ways it is being used to identify genetically-prone diseases and cure terminal illnesses. This was especially of interest to the insurance companies in the room because a simple genetic screening can be used to drive premium costs and improve underwriting in health insurance. The rest of the day consisted of presentations and panel discussions focusing on the direction of the insurance industry and the incorporation of innovative technologies. As the Summit came to a close, CEO of Startupbootcamp, Sabine Vanderlinden, shared exciting news. 10 new InsurTech startups were selected to join Startupbootcamp’s Accelerator Program starting in February. After the past two days of Selection Days, this brought enthusiasm to the insurance partners and investors in the audience. 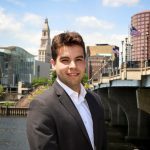 This was especially exciting for the University of Connecticut and University of Hartford students that are participating in CCEI’s InsurTech Fellows Program. In the spring, these Fellows will be working with these InsurTech startups throughout their involvement in the accelerator, inspiring the next generation of entrepreneurs. The week ended with the UConn MBA Case Competition held at Upward Hartford. Every year, first-year UConn MBA students work in teams to analyze complex case studies surrounding emerging business challenges and present their solutions to a panel of judges. This years MBA Case Competition had a focus on InsurTech. Specifically, MBA students were asked to examine the anonymous profiles of 7 InsurTech startups and create a rating system that examines which company had the most effective business model, strategies and value propositions. Many of these anonymous companies were actually inspired by the same InsurTech startups that applied to the Startupbootcamp’s Accelerator Program in 2019. Only a day after the announcement of the 10 selected startups, it was interesting to see how the MBA students selected these startups in comparison to the ones that were selected one day prior. The day concluded with a winning team and runner up team, although all participating teams gave outstanding and informative presentations. 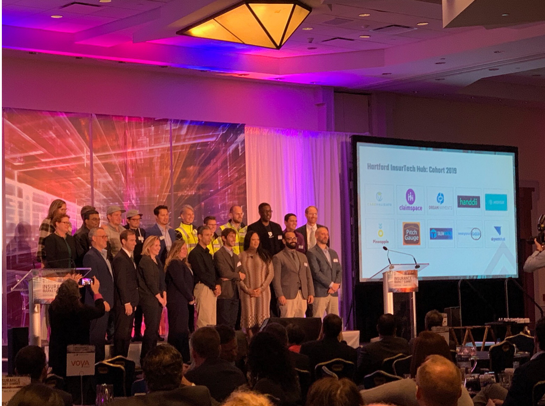 The 10 InsurTech Startups participating in the 2019 cohort of the Hartford InsurTech Hub accelerator were announced at the Insurance Market Summit. Welcome to Las Vegas! This year’s InsureTech Connect Conference was one for the books. 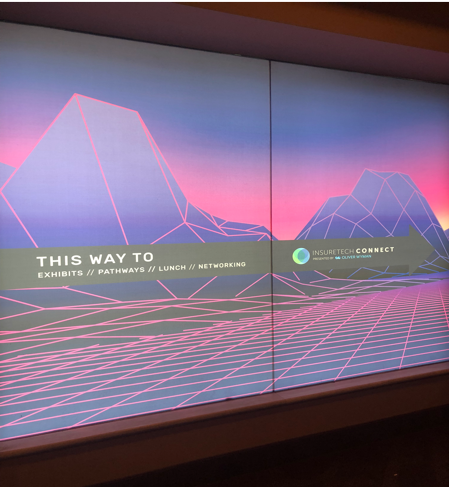 Thousands of professionals traveled from across the country and world to learn and connect with others surrounding the fascinating industry of InsurTech. There were a variety of panels, discussions, speakers, and presentations all with a similar purpose in mind-to open up the perspectives of all the insurers, startups and professionals in attendance. The event opened with the plenary sessions, hosted by the CEO and co-founder of InsureTech Connect, Jay Weintraub. Here we heard from some very notable industry leaders who shared the importance of innovation in a traditional industry such as insurance. Attendees were able to gain a deeper understanding of what the future holds for InsurTech. We also heard from the CEO of Credit Karma, Ken Lin, who launched a new product right on stage! Soon consumers will have a way to go on the Credit Karma app and view their insurance score and compare prices on auto insurance based on their credit. The plenary sessions ended with a panel discussion called “Money Talks: Insurance. Innovation.” CEO of Hamilton Insurance Group, Pina Albo and CEO of Argo Group, Mark Watson III discussed ways they are integrating innovation within their owns companies and provided guidance on how other businesses can follow suit. Overall, this event was a great way to kick-off InsureTech Connect 2018 and made for a promising conference. Speakers discussed the ways that the industry could be potentially scaling down on traditional insurance by increasing innovation and technology. The audience was also intrigued by how to make insurance more inclusive and available to global consumers through the Q&A portion. One audience member inquired about how companies are working around regulations in developing countries and how it is having an impact on distribution. To answer their question, Senior Managing Director of A.M. Best, Andrea Keenan said that certain countries such as India are integrating insurance regulations into their legislation. She also ended the discussion with one important note, “You can positively impact economic growth through technology”. An InsurTech startup and a Greenfield leader discuss how they moved their traditional insurance companies to become more innovative and technologically inclusive. In the age of digital insurance, Danna Gomez of Urban Advantage and Joe Griffith of Ategrity Specialty Insurance talked about their growth in the industry and their use of a platform solution to improve speed to value, unique customer engagement capabilities, and creating a test and learn environment for new products. Incumbents vs. InsurTechs! A group of traditional insurers battle it out with InsurTech startups in an exciting debate hosted and moderated by Capgemini. On the incumbent’s side, participating companies included Prudential, MetLife, Transamerica, and American Family Insurance. On the InsurTech side, participating companies included Pypestream, Digital Insurance Group, So-Sure, and Verifly. Each participant were required to respond to questions such as “Will InsurTech cause disruption similar to companies such as Netflix, Uber, and Amazon? How will it impact human capital? 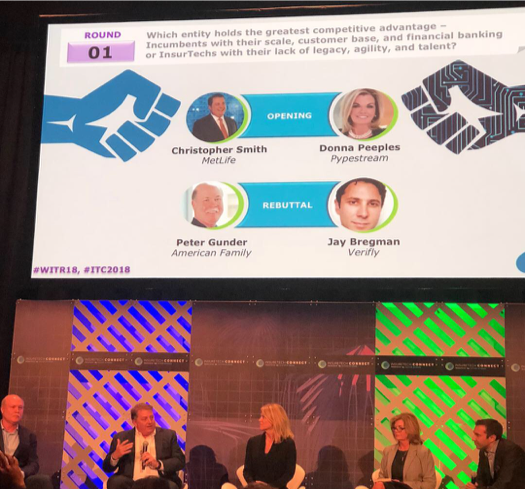 Will it solve the customer experience challenge?” While both teams agreed that technology and innovation is essential to the growth of the insurance industry, incumbents sided with supporting this kind of growth internally and InsurTechs believed that new services that incorporate traditional insurance is the best way to see progress. At the end, the audience members voted on which team they believed to have a more compelling argument and it was a tie! Four innovative women presented their new and exciting InsurTech products to an audience of potential investors, partners and business professionals. Each presented their demos and product designs for technologies that will help improve the customer experience in insurance. CEO and founder of True Flood Risk, Shelly Klose introduced her app that will provide customers with a convenient way to report flood claims. CEO and founder of vHealth Lab, Nina Sesto, presented an app that includes a portable ECG device that monitors a patient’s heart rate at any moment they may be feeling heart attack symptoms. This product hopes to decrease potential hospital visits and reduce unnecessary costs. Next, CEO and founder of VivaMetrica, Dr. Cindy Lane, introduced a wellness app that will use predictive analytics to accurately predict mortality and reduce risk. Lastly, CEO and founder of Rozie.AI, Dr. Sudha Megan, introduced her product that centralizes insurance lines and provides a more efficient way to communicate with customers using AI technologies. This was just the tip of the iceberg for InsureTech Connect. There were a lot more panels and discussions to attend and not enough time to see it all. Gladly, the sessions we did attend provided a very valuable learning experience. The opportunity to learn from industry leaders and connect with InsurTech professionals was bar none. Thank you InsureTech Connect 2018! The goal of the Summer Fellowship program is to help aspiring entrepreneurs move out of the conceptual stage of venture development, and into the marketplace. The program focuses on accepting high-impact ventures with the potential to solve critical human and environmental issues. The Summer Fellowship Finale was held on Thursday, August 2nd. The 10 teams were able to showcase their ventures in front of a panel of judges, and ultimately five teams were selected as Wolff Finalists. The Wolff New Venture Competition features 10-minute presentations by the top five entrepreneurial teams from the CCEI Summer Fellowship program, chosen on a basis of venture viability and value added to the market. A panel of venture experts decide which team deserves the Wolff Prize and the $15,000 accompanying it. This year, the Wolff family has generously increased the prize amount to $20,000. Armin Tahmasbi Rad, UConn School of Engineering Ph.D. candidate, and Leila Daneshmandi, UConn School of Engineering Ph.D. candidate, are engineering a diagnosis device to determine personalized treatment for cancer. Faculty Cindy Tian and undergraduate student Elizabeth Johnson from the UConn College of Agriculture, Health, and Natural Resources are creating a plant-derived antimicrobial treatment for illness in cattle caused by microplasma bovis. The UConn School of Engineering’s Assistant Professor Savas Tasoglu, Ph.D. candidate Reza Amin, and Ph.D. student Stephanie Knowlton, are developing an in-home device with a smartphone-based automated analyzer to measure male fertility. 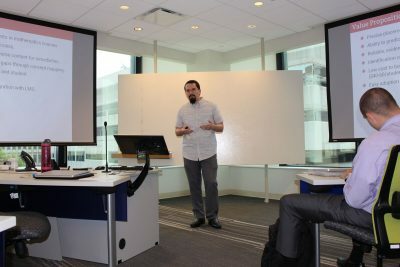 The UConn College of Liberal Arts and Sciences’ Faculty Amit Savkar, graduate student David Nichols, and industry partner William Moschella are creating a predictive analytics platform for student retention in STEM fields. The UConn School of Medicine’s Faculty Robert Aseltine, and postdoctoral fellows Chonglian Luo and Riddhi Doshi, along with the UConn College of Liberal Arts and Sciences graduate student Wenjie Wang and Undergraduate Student Madeleine Aseltine, and in collaboration with industry mentor Cal Colins, are building a program to assist healthcare providers in collecting patient information to improve quality measurement, increase patient engagement, simplify reporting, and maximize reimbursement. Over the eight weeks of the program, these teams demonstrated extreme growth and increased understanding of entrepreneurship. Here is what Summer Fellowship participants feel they took away from the program. 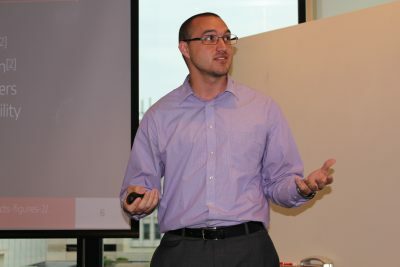 “The summer fellowship experience introduced me to systematic ways of thinking about business, and gave me tools for continuing to think about business in the future like the Business Model Canvas, and taking a scientific approach to testing assumptions that I have about my business,” states David Nichols of SAVKAR.AI. “You get to work with the other teams constantly. 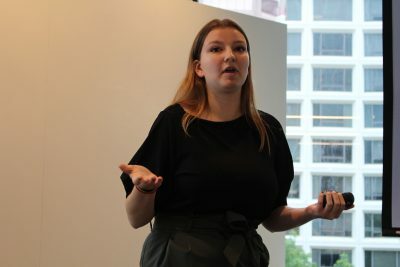 You’re getting their feedback, you’re learning from what they’re going through, and it gives you a great opportunity to network and grow your product without ever leaving the classroom,” says Madeleine Aseltine of WellTech. “It is much more serious than the other programs that you may find, therefore you can dig into the potential that you may have and come up with different scenarios in terms of business models,” states Armin Tahmasbi Rad of Encapsulate. “We had the opportunity to meet CEOs of companies in Connecticut, and we had the opportunity to go and see other companies in Connecticut,” says Reza Armin of QRfertile. “It’s okay not to know all the answers. 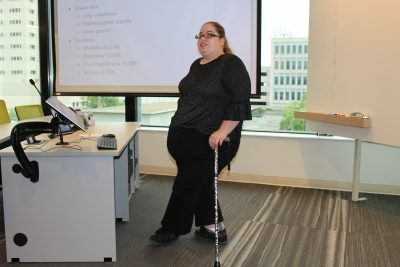 The people in this program will help you find the people who have the right answers so you can delegate out what you’re really good at and other things that people can do that they’re really good at,” says Elizabeth Johnson of MycoZap. The 2018 Wolff New Venture Competition will take place on October 9th in Hartford. 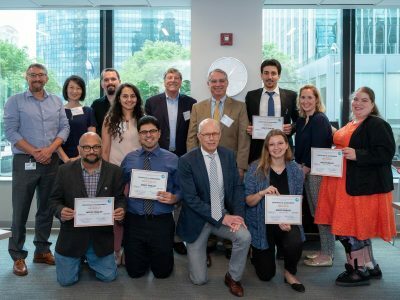 For more information and to read the UConn School of Business’s highlight article about the Summer Fellowship program, click here. UConn School of Engineering graduate Trevor Svec and undergraduate student Philip Gitman are designing self-extinguishing candle accessories, a venture they call WickAway. Not only does their product promote safety, but it can be used with any candle and also is aesthetically pleasing, with stylish designs that will complement any home interior. Svec feels that the most important lesson he has learned in Summer Fellowship thus far is how to build a business model canvas. By the end of summer fellowship he hopes to learn how to make a reasonable timeline for WickAway in the next few years. The team feels that this product is especially important because 50% of fertility issues in couples are a result of male infertility, and usually simple lifestyle changes can be implemented to improve fertility outcomes once the issue is identified. For Amin, this experience has been beneficial in that it taught him how to craft effective strategic plans and “make them happen by commitment”. In the final weeks of Summer Fellowship, Amin hopes he can solidify his understanding of how to “transfer an idea into a product” by putting into practice the financing, marketing, and selling skills he is obtaining from the program. Their product, called MycoZap, primarily intends to prevent diseases like pneumonia and mastitis. The MycoZap team participated in Accelerate UConn, and decided to join Summer Fellowship because they wanted “to learn more and take the information a step further,” in the words of Johnson. 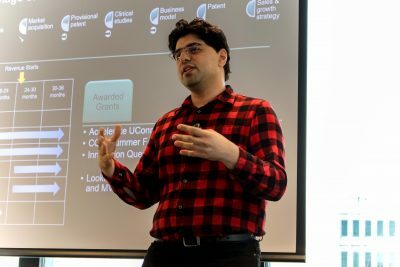 Armin Tahmasbi Rad, UConn School of Engineering Ph.D. candidate, and Leila Daneshmandi, UConn School of Medicine Ph.D. candidate, are engineering a diagnosis device to determine personalized treatment for cancer. The name of their venture is Encapsulate. “Our automated tumor-on-chip system grows patients cancer cells outside the body and tests the efficacy of chemotherapeutic drugs against them to advocate for the best course of treatment,” says Entrepreneurial Lead Tahmasbi Rad. The Encapsulate team feels that thus far in Summer Fellowship they have mastered defining their initial business plan, marketing strategies and step by step company expansion. This program, called WellTech, is a patient health screening platform that will screen patients for a variety of different diseases and risk factors to improve patient care and maximize reimbursements for the providers. The WellTech team decided to join the Summer Fellowship after completing the Accelerate Uconn program in the spring of 2018, wanting to continue the work they had started and learn more about how to expand their business model. Next up in our Summer Fellowship team highlight series is SAVKAR.AI. 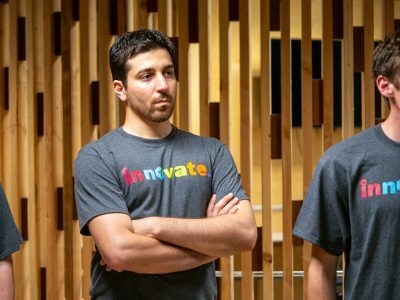 The UConn College of Liberal Arts and Sciences’ Faculty Amit Savkar, graduate student David Nichols, and industry partner William Moschella are creating a predictive analytics platform for student retention in STEM fields, called SAVKAR.AI. SAVKAR.AI entered Summer Fellowship with the intent to learn about business, and that goal has been achieved. Nichols states that the most important lesson he has learned thus far in the project is to always validate assumptions. By the end of the program, he hopes to learn how to think like an entrepreneur and to cultivate the skills that are required for to continue learning and gathering information about this and other business ventures.